One of the best features of no crm.io is that you have access to a complete history of your exchanges with a prospect. It’s helpful when you're closing leads with long cycles. For example, after a few weeks of inactivity you might not be able to recall certain conversations and decisions you made along the way – certainly without the history log. But in order to re-learn all this information, you absolutely need to write down the last exchange you had, every time - or you might forget it. 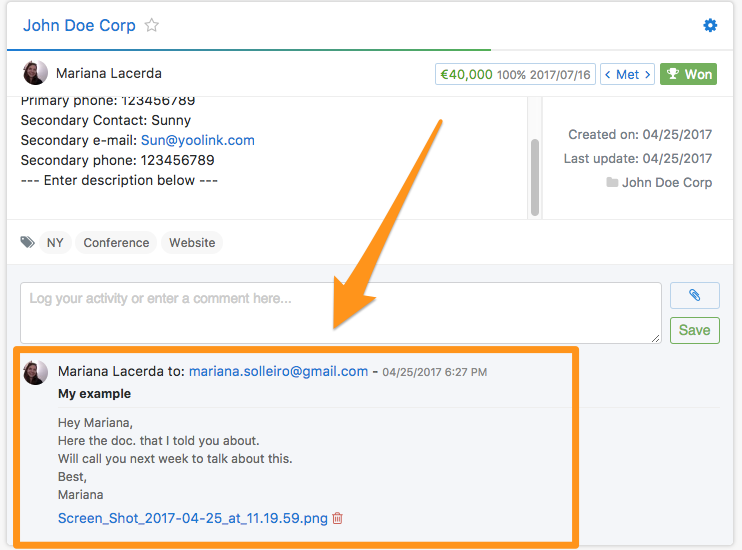 If you’re working on prospects, you can add the comment inside the spreadsheet (in the comments column); for example, when the person didn’t pick up the phone. However, when it’s a qualified lead, you need to be able to rapidly get access to the last exchange you had: if you spoke over the phone, you need to sum up what you have talked about and mention the next thing you need to do. If you sent them an e-mail, you need to have that e-mail associated with the person’s file. Inside no crm.io we make it easy for you: underneath every lead there is a comment field where you can type all the information you need. Alongside this, there's a BCC system which enables you to automatically attach all the e-mails you send to a contact – straight to their lead, without the need to copy and paste. Keeping everything in a single place is not only important, but made easy with YDNCRM.